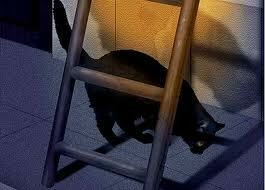 Losing Sanity: Are You Superstitious? Superstition is a funny thing. I was never superstitious as a kid, but lately I find myself knocking on wood and avoiding black cats and ladders (even though I'm convinced not walking under ladders is just good common sense). My latest superstition has to do with blogging. I know! How shocking that a writer would be superstitious about something connected to writing. I'm a bit nervous that talking about my newest craziness is going to somehow anger the gods of superstition but my curiosity to hear about other people's writerphobias outweighs my nervousness so I've decided to chance it. Somehow, in my journey through blogotopia, I've decided the amount of followers on my blog is directly linked to the amount of blog posts I've posted. The correlation has been shockingly consistent right from the get go. What scares me is whether it works the other way around. Will I lose a follower for every day I don't post? Does it count if I write the post and then don't post it? 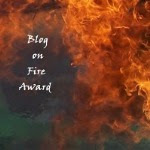 What about when I guest post on someone else's blog? There are way too many loopholes and, I might add, it's particularly painful to be a superstitious lawyer. A few weeks ago I was ready to give up on the whole idea because my posts were slowly outnumbering my followers....then all of a sudden I had a whole bouquet of new followers (each and every one of you made me smile) until I was back up to the same ratio. You all understand that the beauty of this is if I post every single day for the next two years I could have 730 new followers! Hmm, maybe I'll just be content with the ones I have and *try* to stop being so superstitious. I've shared mine, now it's time to share yours. And not just because you'll make me feel better for being so mezzo matto! I think as you get older you get more superstitious, because you understand that bad things can happen. Quite a gloomy thought really. And you are doing well! I have 574 followers at 700 posts, so somewhere I fell behind, but I feel okay about it. I think there is a spot around 400 that it gets significantly harder to keep growing, as there are just too many for full reciprocity. Christine, Abby and Hart, did you see SB's comment? I'm suddenly getting even more superstitious! I do believe that you NEVER EVER open an umbrella indoors. EVER! Why is Camp Giving my Daughter Body Issues?